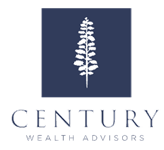 Century Wealth Advisors focuses on effective financial planning creating stability in the face of life’s many uncertainties. While providing an overview of the big picture, we want to listen and learn from you so we focus on your individual goals. As fiduciaries, we make it a point to develop a through understanding of your needs and objectives so that our recommendations are always in your best interest. Advisory services are offered through Emerald Investment Partners LLC (“Emerald”), a registered investment advisor doing business as Century Wealth Advisors. Registration does not imply a certain level of skill training. More information about Emerald can be found in Form ADV Part 2 which is available upon request. Information presented is for educational purposes only. It should not be considered specific investment advice, does not take into consideration your specific situation, and does not intend to make an offer or solicitation for the sale or purchase of any securities or investment strategies. Investments involve risk and are not guaranteed. Be sure to consult with a qualified financial advisor and/or tax professional before implementing any strategy discussed herein.